With tickets reportedly exchanging hands for many thousands of rupees, an estimated 28,000 packed into the Punjab Cricket Association Stadium and every possible vantage point outside the ground taken, a match of such magnitude between the fierce rivals deserved to be a classic encounter. Misbah had played a curiously subdued innings, with his first 27 taking 52 balls, and though he hit two fours and a six in six deliveries 30 were needed from the final over and India justified their decision to field three seamers by defending a relatively modest total. The start of the India innings after they opted to bat on a pitch showing tinges of green saw Tendulkar overshadowed by the remarkable Sehwag. With precise clips off his legs and sweetly-struck drives, Sehwag struck five fours in an over from the wayward Umar Gul and had amassed 38 by the end of the fifth over. 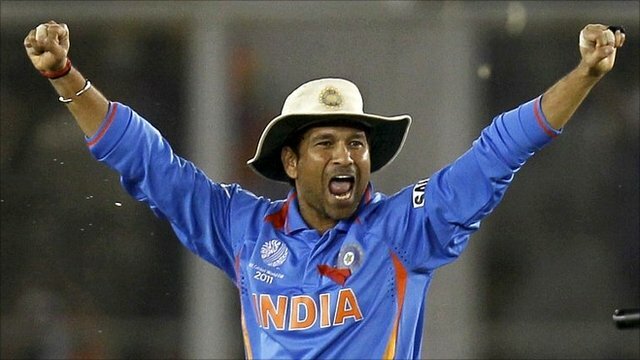 But he was lbw trying to turn one from Riaz to leg and as India reached 50, Tendulkar’s innings was still in its infancy with eight to his name from only 11 balls faced. He soon demonstrated some exquisite timing as a defensive flick raced through mid-on for four, before he was given out lbw on 23 to the spin of Saeed Ajmal. Umpire Ian Gould’s decision looked perfectly correct as Tendulkar was hit playing across the line but under review the ball tracking system indicated it was turning down the leg-side sufficiently to miss the stumps, and to the great delight of the vast majority of the crowd the decision was overturned. There was an appeal for a stumping next ball which was also rejected after a replay, while the first drop occurred with Tendulkar on 27 when Misbah-ul-Haq failed to cling on diving to his right at mid-wicket. The India 100 came up in the 16th over but Pakistan began to slowly claw their way back, Gautam Gambhir deceived in flight by Hafeez and stumped. Inexplicably Younus Khan spilled a routine chance at extra-cover with Tendulkar on 45 and the opener duly completed his 95th one-day international half century by taking the aerial route safely over the cover fielders for his eighth four. Left-armer Riaz soon brought Pakistan firmly back in the contest with wickets in successive balls to restrict India to 141-4, Virat Kohli mis-timing straight to point and Yuvraj Singh bowled first ball by a low, late-swinging full toss. Tendulkar saw a thick edge brush the gloves of Kamran when on 70 to the exasperation of the ever demonstrative Afridi, who went wicketless for the first time in the tournament. Then on 81 Umar Akmal spurned another opportunity, parrying the chance at mid-on in the style of a goalkeeper pushing the ball over the crossbar, with spinner Hafeez making a few choice observations on the error. But 15 short of the landmark Tendulkar drove to extra-cover where Afridi made no mistake, and the run-rate soon dropped below five for the first time since the end of the second over. Dhoni has now gone 13 innings without an ODI fifty and his sedentary 25 from 42 balls bore no resemblance to Sehwag’s innings apart from the manner of dismissal, an attempted turn to leg off left-armer Riaz. Three fours were taken in an over from Gul, whose eight overs cost 69, but Pakistan would surely have expected their required rate to be substantially more than 5.20. Understandably their openers were not able to match Sehwag’s rate of scoring but they utilised the fast outfield and had three boundaries apiece after seven overs before Kamran cut to point. The crowd had been subdued by Pakistan’s assured start but they were revived when Hafeez attempted a reckless ‘Dilscoop,’ trying to work to leg from well wide of off-stump and feathering a catch to wicketkeeper Dhoni. Almost seven overs had elapsed without a boundary when Asad Shafiq, having calmly accumulated 30, lost his middle stump trying to cut Yuvraj’s slow left-armers and with the rate rising above six the match was in the melting pot. Younus survived a missed stumping in Yuvraj’s next over but three balls later drove tamely to extra-cover. Timing began to look difficult on the slow surface under the numerous low floodlights dotted around the ground but Umar hit a four over cover and a pull for six off Yuvraj, the first boundaries for 12 overs, to reduce the requirement to 131 from 20 overs. A six over the sightscreen from Umar saw the crowd go quiet again but from the first ball after the drinks break Harbhajan Singh struck a key blow with a quicker ball from around the wicket that straightened and breached his defences. Dangerman Abdul Razzaq was dismissed cheaply by a cutter from Munaf Patel and though Afridi made a quickfire 19 to leave 77 needed from 50, he sliced a Harbhajan full toss to cover. Misbah’s brief late burst of hitting proved in vain and now attention turns to an enticing final in Mumbai, which will feature Tendulkar on his home ground seeking to record that 100th hundred against Sri Lanka’s own talisman, Muttiah Muralitharan.